Heat 1 tbsp of the oil in a large pan over a medium heat. Make sure it is a large pan as there will be a lot of meat sauce here. Add the onions, celery and carrots and fry until soft, about 10 mins, stirring occasionally. Add the garlic and cook for another few mins. Increase the heat and add the beef. Break up the mince as it cooks so that you don’t have clumps of meat. Once it is browned, season lightly with salt and pepper. Add the tomato puree and mix everything together thoroughly. Add the red wine and cook until reduced slightly. Add the tinned tomatoes, sugar and 2 of the bay leaves. Bring to a boil, then cover and reduce to a simmer for 20 mins. Remove the lid and simmer for a further 20 mins, stirring every so often. Add the vinegar and the basil. Taste and see if the sauce needs further seasoning. Next, make the béchamel sauce. Put the milk, butter and flour into a heavy bottomed saucepan and bring to the boil, stirring all the time. Add a bay leaf and simmer for 10 mins, whisking occasionally to stop lumps forming, until the sauce has thickened. Remove the bay leaf, add 40g of the parmesan and the nutmeg. Stir until the parmesan is completely melted into the sauce. Taste and season as needed. 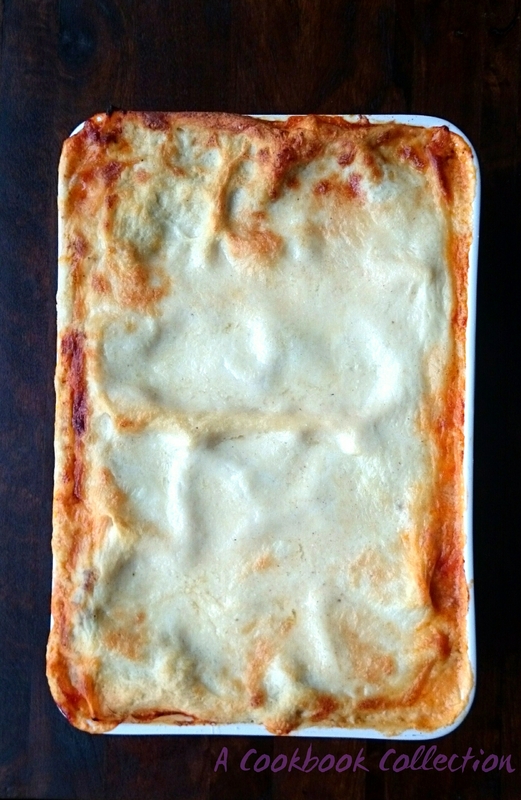 Spoon a thin layer of béchamel sauce on the bottom of your lasagne dish to stop the pasta from sticking. 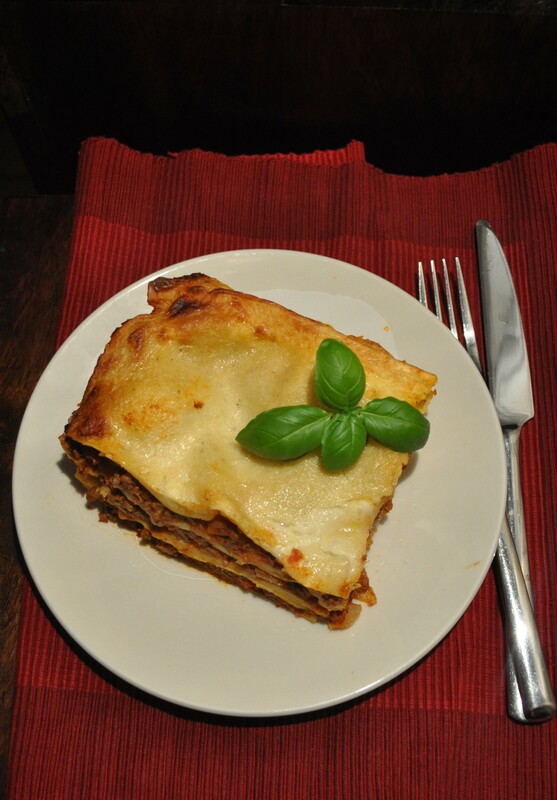 Put a single layer of lasagne sheets on top. Remove the bay leaves from the meat sauce and spoon a third of the sauce onto the pasta sheets. Cover the meat with another layer of lasagne sheets. Spoon a thin layer of the béchamel sauce on top, then sprinkle half of the mozzarella on top. Spoon another third of meat sauce on and repeat layer of lasagne, béchamel and mozzarella. Spoon remainder of meat sauce on top, final layer of lasagne sheets and the remainder of the béchamel sauce. Sprinkle the remainder of the parmesan on top in an even layer. Place in the oven and cook for about 30 mins. The top of the lasagne will bubbling at the edges, have browned slightly and a knife should easily pierce through the lasagne. If you used dry pasta sheets, the cooking time may take longer. Allow it to stand for about 15 minutes before cutting and serving. 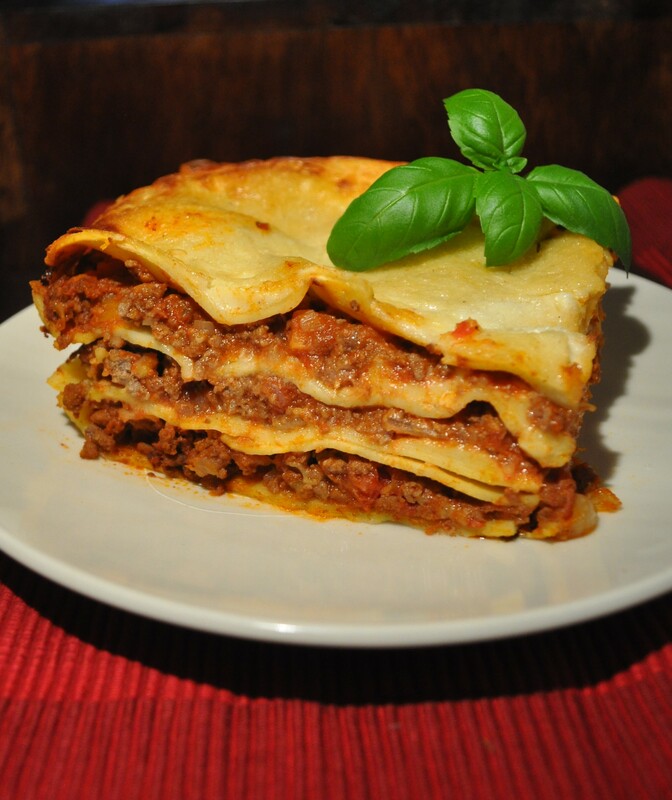 Looks delicious, I adore a lasagne.